I recently led a Psychometry Workshop at the Quantum Healing Institute of Holistic Health in Honolulu. 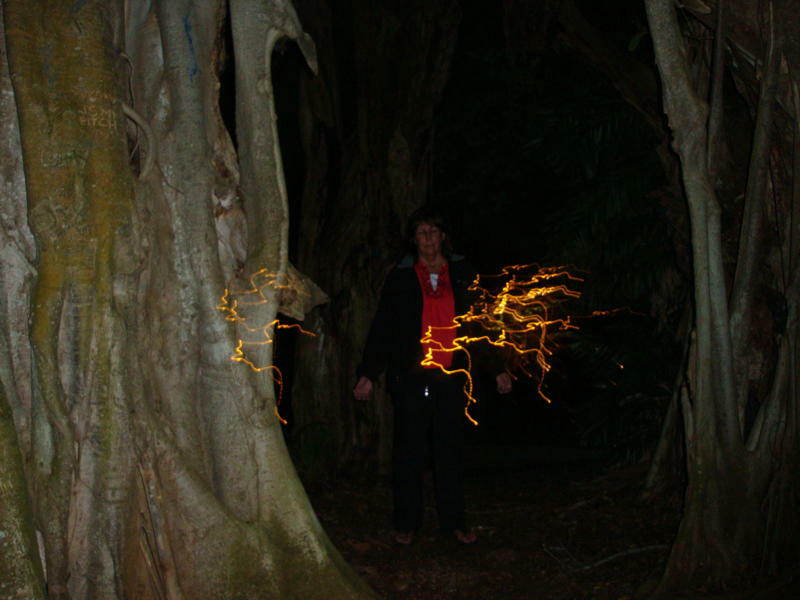 Psychometry is discerning the energy that has been imprinted on an object or place by people or events. For some, psychometry conjures up B-movie images of fake Gypsy fortune tellers holding an object, going all googly-eyed, and giving a dire description of a horrible fate for the person who owned the object. For the sake of argument, let’s set the spooky elements aside and look at psychometry from another angle. Our world is made of energy. We’re now converting the energy of wind, solar, water, and of course, oil to power our homes and vehicles. There’s no such thing as a solid object. Molecules charged with energy create an illusion of solidity. We humans are energetic beings, complete with electrical circuitry to fire our brain, pump our heart and propel us through our daily lives. Whether we recognize it or not, we are constantly being influenced by the energies around us. Studying psychometry builds our awareness of surrounding influences. In some situations, a knowledge of psychometry may be protective. Object Psychometry ~ Energetic impressions in a object imprinted by previous owners. Location Psychometry ~ Energy imprinted into places by events or emotions. People and animal Psychometry ~ Energy frequencies projected by living creatures. Basically, we are living in a psychometric sea of energy every day. Most people go along with the push and pull of such forces in their daily lives and cope the best they can. For empathetic people who are highly influenced by these swirling energies, learning more about them makes life easier to handle. For instance, a few years ago I was on vacation with my husband in San Antonio, Texas. As we happily strolled the old downtown area, we saw an inviting Catholic Church. I walked up the steps and pulled open the wooden doors. White washed adobe walls surrounded rows of old wooden pews. Beautiful statues stood in stations around the perimeter. I wanted to circle the room and see the art. However, just a few steps in, I was hit with a wave of sadness. The more I walked into the space, the deeper sense of grief overwhelmed me. It felt as if the very walls were weeping. Tears came to my eyes. I thought if I stayed in that place much longer, I would collapse in a pew and sob. I looked at my husband and said, “I gotta get out of here.” I dashed out the wooden the doors and collected myself back on the sidewalk. He joined me a few minutes later, not having felt anything unusual in the building. Such experiences have taught me to be more discerning. People, places, and things all carry energetic frequencies and information. Some are very uplifting–like swimming in the ocean or seeing the Dalai Lama. Other places and people I avoid, like taking a tour of Alcatraz or attending a rally of White Supremists. Understanding psychometry is a survival tool, especially for more sensitive souls. Knowledge is power. My blood pressure spiked, adrenaline kicked in and I went into fight or flight mode. Thinking there might be a 20 minute window before a blast sent destructive waves through the air, I put my tornado alley training into action. I got dressed, making sure I had shoes on to walk over broken glass and debris, grabbed my purse, a gallon of water and the keys to the storage closet on the first floor of the house. Within a few minutes they had searched twitter to see Rep. Tulsi Gabbard’s message declaring a false alarm. It would be another twenty minutes before civil defense issued their own “oops, my bad” message. So, in the aftermath of all that fear and confusion, the psychometry workshop transpired with about six participants. We were all still wired from the bomb scare. I was a bit nervous that the event might be a flop if nobody displayed any ability, but, fortunately, that was not the case. Everyone brought an item that had had one primary owner. I passed out index cards and they each took one or two objects and wrote their impressions down on the cards. Interestingly, everyone got some details right. One gal in particular was very gifted. She gave whole personality types, knew if the owner was living or dead, and offered descriptions of their homes. She validated the concept of psychometry for the group. As the week passed, the energy from the ballistic missile scare reverberated throughout the islands. Indeed, the psychometric effect of the mass consciousness of fear rippled for many days. I felt like I was absorbing disturbed energy everywhere I went. By Friday, I decided I needed a cleansing massage and made an appointment with a lomilomi therapist. Thankfully, she cleared out the negativity and put me back in balance. Energy affects us everywhere we go. Understanding the principles of psychometry better prepares you to deal with your daily encounters with people, places, and things. I have now heard that phrase dozens of times in the past three years since I moved to Hawaii and began listening to the free audio messages posted at Kryon.com by channel Lee Carroll. Before my move to Hawaii I had read a couple Kryon books with interest, but life was too busy to become absorbed by the material. In 2014 major life changes found me living in Honolulu without any social network or even a car. My feet became my main source of transportation and Kryon messages became the most interesting material to hear as I strolled under the tropical skies. Messages dating back to 2002 are readily available 24/7 for anyone to access on the website. It was case of when the student is ready, the teacher will come. After years of reading esoteric material, the Kryon messages offered the next step of other worldly wisdom about where humanity has been and is heading. From beyond ancient history to the unfolding post-2012 cosmic epoch, Kryon is a teacher for the ages. I have absorbed and embraced much of the world view presented. In January 2017, a notice from a Dr. John Ryan offering a Return to Lemuria Conference with the Kryon team on the Big Island of Hawaii in December popped up on my Facebook page. Interesting. I jumped over to Kryon.com to check it out, but there was no information there yet. Nobody on the 16,000 member Kryon fan page mentioned it. I had never heard of Dr. John Ryan. After the message popped up a couple more times, I checked into Dr. Ryan and discovered he is a board certified Canadian physician who works in mainstream medicine and yet also explores energy medicine. In fact, he has been inspired by visions and metaphysical experiences to develop what he calls Unity Field Healing. Okay, now it was clear why I was getting nudged. 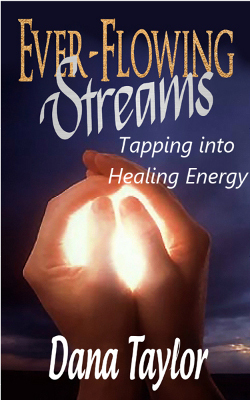 Something new in energy healing? I was definitely interested. But, spend the big bucks to go to a conference? Hmmm. I sent a message to a friend who I thought might be interested in going with me. Her immediate reply–If you’re going, I’m going. Ultimately, she invited another friend who wanted a week in Hawaii, so our condo and car costs were split three ways. Yes! And so, that is how it happened that I was sitting in a posh Hilton conference room with Kryon followers from around the globe and heard, “Greetings, Dear Ones, I am Kryon of Magnetic Service” in person. Over the course of time Lee Carroll has developed a retinue of companions who serve as presenters for various topics. Dr. Amber Wolf leads meditations and Lemurian Women events. Robert Coxon and Lilly Wong offer spirit language and music. Prageet Harris and Marilyn Harper channel other entity messages. Kahuna Kalei adds her Hawaiian spirituality to the mix. The regular Kryon gang was there and I was excited to experience them in person, not just as disembodied voices coming through the ear phones. Part of me feared I would be disillusioned, as happened with another prominent energy healer I saw in person, who came across as a money grubbing ego maniac. I am happy to report no obnoxious egos or money grubbers were in sight. In fact, Lee Carroll, the main attraction when channeling Kryon, was otherwise a low-key participant. He didn’t play up any celebrity hype, but actually made sure the audio visual equipment worked properly. People respected his humility and shied away from demanding photos. What’s more, there wasn’t any Kryon paraphernalia for sale. No mugs, buttons, magic stones or even books. Other presenters had items for sale, but it was modest. The meat of the conference was in the presentations and more importantly, in the meditations. The theme had been billed as Return to Lemuria and Akashic Remembrance. Dr. John Ryan revealed he had been instructed by his guides to sponsor the conference. It seemed important to bring together healers from around the globe to have the joint experience and learn more about Unity Field Healing. Kryon and others have identified Lemuria as the first place of civilization on the planet. According to Kryon folklore, Hawaii was once one great continent. The earth once rose like a great bubble of land from the volcanic pressure below. A more balanced civilization of gender equality than we know today blossomed for a time. As the land began to sink, people fled the region and traveled to other parts of the world, taking much of their culture with them. Despite the passing millennia and modern cultural destruction, Hawaiian kahunas still honor the Lemurian ancestors today and guard many ancient traditions. Englishman Prageet Harris often joins Kryon events and channels an entity named Alcazar. He has created a sacred geometric structure dubbed the Stargate, which stood in the room throughout the conference. For me, the most powerful parts of the conference were the meditations led by Prageet Harris and his companion, Julieanne Conard, both channeling Alcazar. The energy was palpable. Being in a meditative state, I don’t remember all the details, but something happened. When Prageet invited the Lemurian masters to rise up from under the earth of Hawaii and into our auric fields, I started shaking, coughing, and my eyes watered. It felt a bit like hanging onto a multidimensional roller coaster. A great ride! During the second meditation, I “felt” a finger on my forehead, as if I was receiving an attunement. Learn more about Prageet Harris and the Stargate at TheStargateExperience.com. On Thursday four buses loaded up and traveled through the center of the island. The amazing terrains of the Big Island constantly inspire. The mountains of five volcanos tower like ancient guardians. Vast lava fields sprawl beneath them, giving way to primordial forests. Glimpsing a dinosaur would not be surprising. After two hours, we arrived at Hawaii Volcanoes National Park. Visitors experience steam vents spewing gases into the air and can overlook the churning “cauldera,” the heart of an active volcano. Kahuna Kalei led the group to sacred male and female heiuas on the rim over the volcano and offered holy chants. I sat on the earth and meditated, absorbing the energies of the volcano and the ceremony. A steady rhythmic beat from within the earth made me gently sway with it. We enjoyed lunch and a Kryon channel on the grass at the visitor center. My bus buddy, Virginia, and I lay down on the soft lawn and basked in the sun, letting the words of Kryon drift over us. Really out of this world. Finally, on Saturday night came the main reason I believe I went to the conference–to hear Dr. John Ryan. I had purchased his book, The Missing Pill, several months before, so I had an idea of the material he would present. Anticipating the four hour presentation, I feared I would have trouble staying awake. But, no, I was riveted. It wasn’t so much that I heard anything new. Quite, the contrary, after years of reading books on healing, quantum physics, and listening to hours of Kryon messages, I already knew most of what Dr. Ryan revealed. For me the biggest take away from Dr. Ryan was validation. Here was a respected physician coming forward and speaking openly about multi-dimensions, visions, the unorthodox Kryon version of human history, and energy healing. What’s more he’d also had visions of quantum DNA that resonated with my own experience. A while back I had a vision of DNA with an invisible, but very real, quantum strand of light entwined in the usual DNA models we see. Now Dr. Ryan was presenting a healing modality opening the idea of healing and releasing the power of DNA. Kryon has said humans only use about 33 percent of their DNA. Children will be born with higher activation. When humans reach over 40 percent, they will tap into true multidimensional abilities. It seems to me the concept of Unity Field Healing adds two components to the current understanding of energy healing. The first is working with DNA. In Reiki and other modalities, we have been working in the auric energy fields, offering balance, releasing energy blocks, raising frequency. But Unity Field Healing adds another layer of working with DNA, the basic building blocks of the cells. The potential for healing is enormous. Though I was reading between the lines a bit, I think the second new component from UFH may be working in the Akashic Field for healing purposes. Kryon speaks of “mining the Akash” for skills and attributes from past lives that are sitting in our energy fields. As UFH develops it may very well enlarge our understanding of Akashic memory and ties. Currently, the most utilized method to deal with troubling past life issues is through past life regression hypnosis as developed by students of Michael Newton, Brian Weiss, and Dolores Cannon. Could UFH arise in the post-2012 energy to heal those lingering old energy ties? Dr. Ryan offers three attunements via audio files on his website for the modest price of $60. To close his session, he played a 40 minute meditation. At the time, it wasn’t as noticeable an energy experience as others had been during the week. However, my dreams that night were very telling. They were almost nightmares, revealing various fears I have had through the years. My dreams seemed to cleanse and release. In the morning I felt a sort of hole at my heart chakra, as if I had done some emotional house cleaning. I appreciate that Dr. Ryan has the courage to speak out about these unconventional areas, undoubtedly with some professional risk. The week was definitely a milestone for me. I enjoyed the full-on Kryon experience. I met Light Workers from the US, Australia, Germany, Finland, Switzerland, France, India and beyond. I no longer feel so isolated or strange in my emerging world view. Feeling ready to “take it to the next level,” I returned to Honolulu and immediately was offered the opportunity to lead a multidimensional workshop. As Kryon would say, And so it is. When I first met Angela Studer, The Stone Whisperer, two years ago she was, frankly, terrified. She and I had both washed up on the Hawaiian shore about the same time. I was a new widow embarking on the next phase of life, whatever that might be. Angela had been excited when a new job for her husband of 27 years had brought their family to Oahu. Living the dream turned nightmarish when he abandoned her and their son, leaving them less than $200 in the bank. Born with psychic gifts and an optimistic spirit, she had endured the long, abusive marriage by focusing on the positive. On the mainland, she had developed a spiritual business designing crystal jewelry, offering energy healing, and classes as The Stone Whisperer. She raised a developmentally challenged son and made the best of a bad marriage. Suddenly, she found herself in the middle of the Pacific ocean in one of the most expensive places to live. She couldn’t make her condo payments and wondered if she would soon be joining the ranks of the homeless, living under tarps on the sidewalks sheltered only by banyan trees. Despite her fear and trepidation, Hawaii felt like home. Indeed, the rocks and native Hawaiians seemed to welcome her as “o’hana”–family. Though she expected to receive an eviction notice any day on the condo, she took good care of it. Inspired by her view of ancient volcanic mountains, she turned her backyard into sacred space. Bleached coral washed up on the beaches formed the boundaries of a labyrinth. She explored the west side of Oahu, an area seldom visited by tourists. She discovered sacred sites and energetic healing spots. Her spiritual guides brought creative ideas to mind to create income and utilize her gifts. She began offering “Hidden Oahu Spiritual Experience” tours. Visitors from around the world can get off the beaten track and be refreshed in quiet groves and tidal pools, and receive Angela’s unique healing gifts. Every tour is different, inspired by her guides’ leading for the people involved. Crystals and gems began speaking to Angela again. New pieces of gallery quality, wire wrapped jewelry emerged from her imagination through the movements of her fingers with the wire and stones. She imbues each piece with healing energy. Our paths have crossed intermittently through the past two years. I’ve visited her home for classes. The energy from all the stones and crystals is palpable. Her house has truly become sacred ground. Angela exudes a shining energy of love. Though she’s been forced to live a very hand-mouth-existence, she’s developed a deep faith in the God’s provision. Yet, she does her part. Seeking a firmer financial footing, she took real estate courses and recently passed her exams. She is now a licensed realtor. She will bring her special gifts to her clients, offering to bless the houses they buy and sell through her. A vision is developing of a spiritual sanctuary with workshops, labyrinth, and guest rooms. Seeing what Angela has accomplished in two years against the odds makes her dream seem quite plausible. Angela is so much more than a survivor, she is a beacon of the Aloha spirit. If you’re visiting Oahu soon, consider adding a Hidden Oahu Sacred Experience to your “must do” list. You may discover the stones will whisper to you also. Move over quinoa, there’s a new indigenous superfood on the block–the amazing ‘Ulu! Since moving to Honolulu a couple of months ago, I have been tipping my toes into Hawaiian culture. This week I attended a presentation at the local library about ‘ulu aka breadfruit, a neglected treasure of the South Pacific. ‘Ulu was once the staple of the islands. When Englishmen set foot on Maui in 1793 an eighteen mile grove existed that produced 70 million pounds of breadfruit a year. By 1850 much of it was gone. A major highway now exists along that path. About a hundred old trees still exist, hiding in plain site a resource that could feed millions of people in the coming generations. A beautiful legend called the Gift of Ku tells of a time of drought and famine on the islands. Ku and his wife had many children, growing weaker and more gaunt as each day slipped by without sufficient food. Ku knew of a way to feed his family, but it meant sacrificing his life. Ku and his wife had a very sad parting as she gave him permission to end his life to save his children. Ku stood tall and then was sucked into the earth. Soon, a new kind of tree sprouted in his place–the ‘Ulu. Read the full story here. ‘Ulu fed islanders for centuries until colonialism and Westernization forced plantation farming over forest agriculture to fuel a money-driven colonial economy. Younger generations learned to prefer white rice and spam over the old “starvation” and “slave food” hanging on the ‘ulu trees. All was not lost. Keepers of old traditions and knowledge remained and kept stands of trees alive throughout the Pacific. Now, scientists and agriculturists are joining forces with tribal and island leaders to revive the bountiful breadfruit for the modern world. 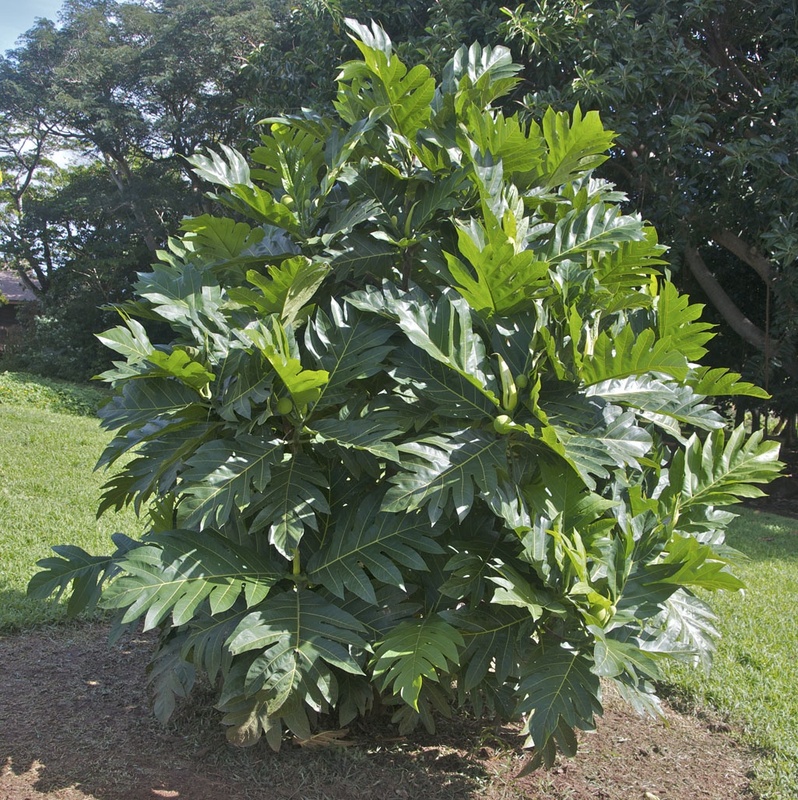 The Breadfruit Institute has been formed by the National Botanical Tropical Garden to nurture a new ‘ulu agricultural system and educate the world about the benefits of ‘ulu. 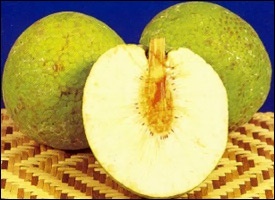 As in line with other tropical fruits, breadfruit too holds lots of calories. 100 g fresh fruit provides 102 calories. The major fraction of this comes from the carbohydrates. Ripe fruits are sweeter since their starch content is converted into sucrose and simple sugars like fructose and glucose. 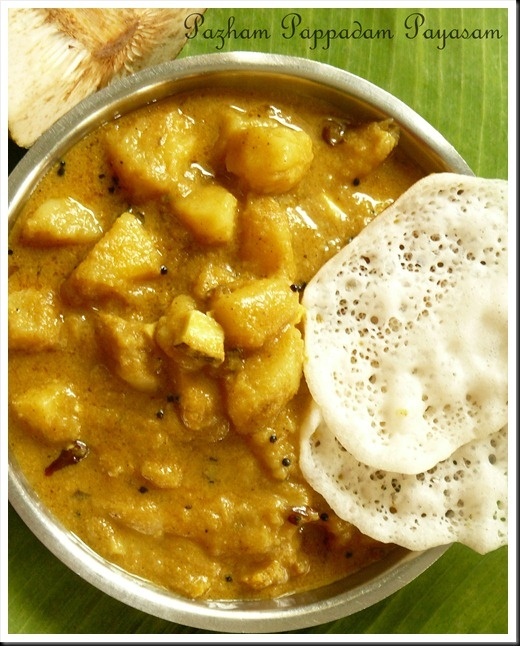 Its pulp has more fiber than in jackfruit, which makes it a good bulk laxative. Dietary fiber helps reduce blood cholesterol by preventing its absorption in the gut, reduce obesity, blood pressure and help protect the colon mucous membrane by warding off cancer-causing chemicals from the colon. 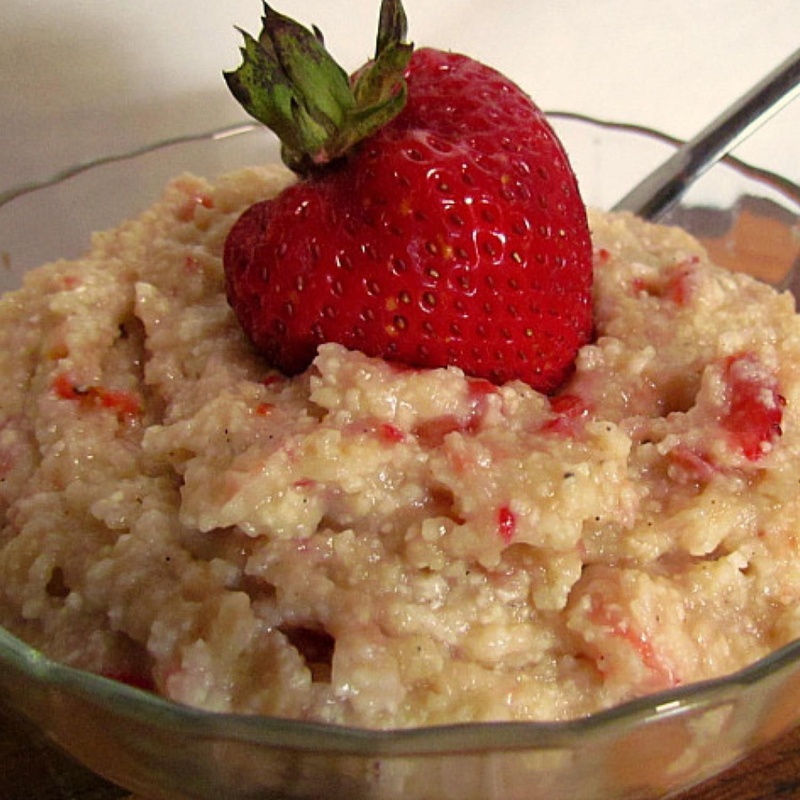 The fruit has moderate levels of essential vitamins, and minerals. Like other tropical delicacies, it is rich in many vital B-complex groups of vitamins. The fruit is a moderate source of vitamins, especially thiamin, pyridoxine, and niacin. Fresh fruit is an excellent source of potassium. Potassium is an important component of cell and body fluids that help regulate heart rate and blood pressure. Its pulp is good in copper, iron, magnesium, and phosphorus. Breadfruit seeds contain average levels of protein; 100 g seeds provide 7.4 g or 13% of daily-recommended values. However, they are excellent sources of minerals like potassium, iron, calcium, zinc, selenium, manganese, etc. Commercially, ‘ulu has a myriad of possibilities because the fruit is so versatile. Unripened fruit is high in vitamin C. Islanders from ancient times carried it in their canoes to stave off scurvy. Today that fruit is delicious in a pickled form, much like pickled artichokes. Mature fruit can be used in dozens of recipes– appetizers, salads, main dishes, desserts, and baked goods. 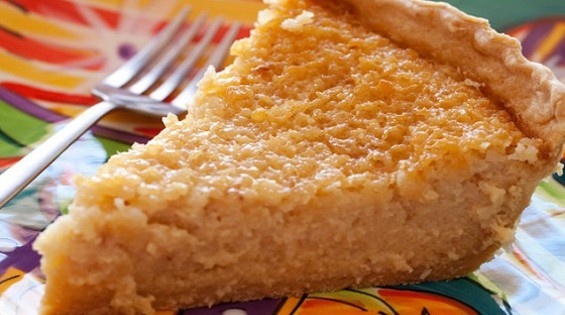 Breadfruit flour is gluten free and makes excellent flat breads, cookies, and so much more. 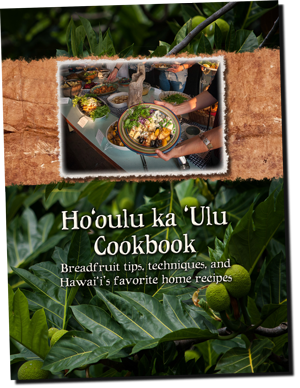 The National Botanical Tropical Garden has a recipe book, Ho`oulu ka`Ulu Cookbook: Breadfruit tips, techniques, and Hawaii`s favorite home recipe available of contest winning recipes from across the islands. ‘Ulu may help us survive the upheavals of global warming. It is hardy and thrives in a variety of wet and dry climates. So, ‘ulu, or breadfruit, maybe the Next Big Thing. Remember, you saw it here first! For more information visit The Breadfruit Institute. Since my move to Hawaii two months ago, I’ve been learning about island living. Discovering new culinary experiences–sushi and sea asparagus. Gazing across the aqua warm waters, whales surface blow misty spray. Kayakers, snorkelers, and surfers enjoy a liquid playground. Of course, there are risks when frolicking in nature. A local newspaper article about jellyfish featured useful information for anyone planning a tropical vacation. 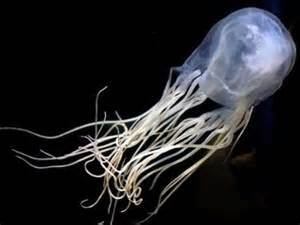 If you or a member of your party got stung by jellyfish, what would you do? 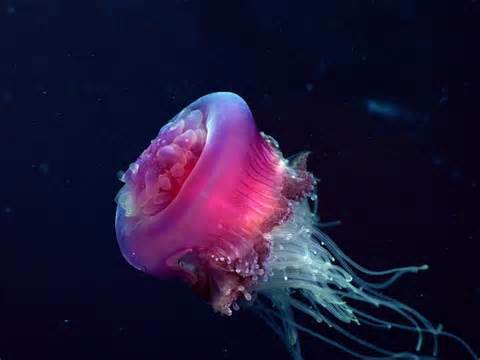 About Jellyfish: The box jelly and man-o-war jellyfish are the most commonly found species around Hawaii. The box jelly sting is 10,000 more damaging than a bee sting. The venom acts more like snake bite and causes cellular destruction. It is extremely painful. An encounter can cause serious systemic reactions that go far beyond irritating the site of contact. Encounters are most likely the week after a full moon at dawn and dusk. Experts estimate possibly 10,000 stings a year around the Hawaiian islands. Don’t douse in cold water. That only spreads the venom and continues cellular damage. Don’t use ice packs, alcohol, or spray-on pain relievers like Dermoplast. All will increase the action of stinging cells. Immediate immersion in hot water. Action of cell invasion by the venom is halted. Flood contact site with vinegar or epsom-salt water to remove tentacles and rinse undischarged venom. Emergency workers can start an epsom-salt start IV drip to greatly reduce pain. How about that episode from Friends? Remember when Rachel is stung by a jellyfish and the guys administer first aid her by urinating on her? Actually, that is a recommended action. The acidic quality of the urine will counteract the venom. If the “delivery system” is immediate, the temperature should be about 98.6F to quell the venom action. If you don’t want to be like Rachel, adding a small container of vinegar in your beach bag along with the obligatory sunscreen, is probably your best first line of defense after a jellyfish encounter. Of course, don’t get in the water if there is any activity in the area. Though strangely beautiful, a jellyfish sting will surely ruin a wonderful tropical vacation. Be smart, be safe. Have a wonderful time in the tropics! Hanging out in Hawaii has definite advantages – tropical breezes, fish tacos, beautiful birds, interesting hiking opportunities. 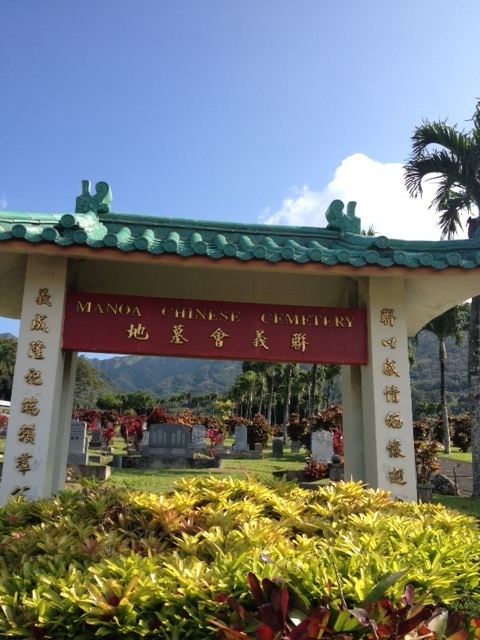 Yesterday I set off to visit one of my favorite spots– the enchanting Monoa Chinese Cemetery. As I trudged up the hillside surrounded by headstones etched in Chinese characters,weathered with age, the place seemed to be welcoming me back. 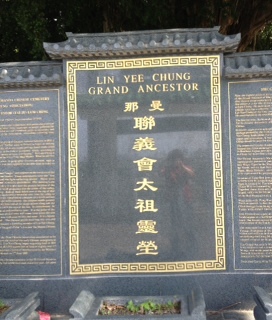 The Lin Yee Chung Association was formed to purchase land. By 1896, 27 acres had been acquired. A perpetual charter was granted by the Kingdom of Hawaii in 1889. Today the graves are looked over by a massive banyan tree planted 100 years ago by a relative of Lum Ching to honor his final resting place at the top of the hill. While the cemetery is quiet during the day, it is often busy at night as tourists are led to the tree on a haunted tour of Honolulu. 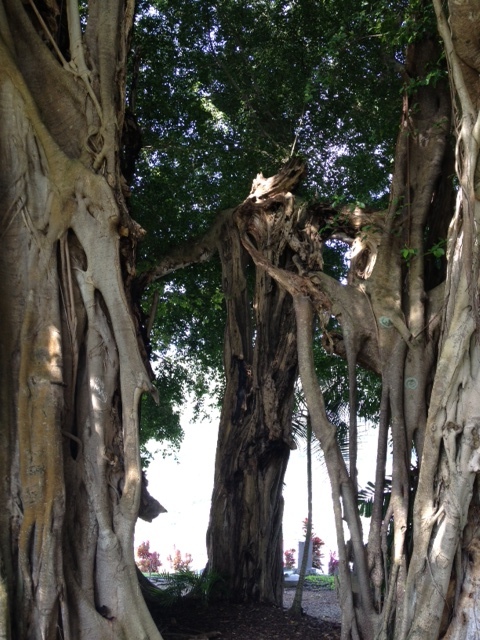 A few years ago my Supernal friend, Paula, took the tour and had an amazing experience inside the banyan tree. Patterns of lightning-like energy was picked up by several cameras. She heard voices in the tree that evening. 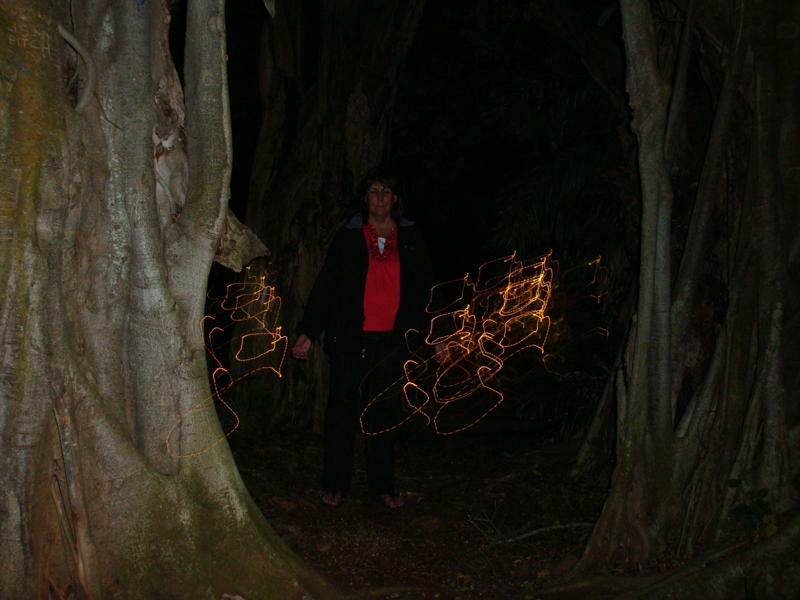 Here are a couple of the fascinating pictures caught of Paula as she prayed standing in the heart of the banyan tree. I didn’t hear anything but the singing of birds on my trip yesterday, but the feeling of peace and love was palpable. 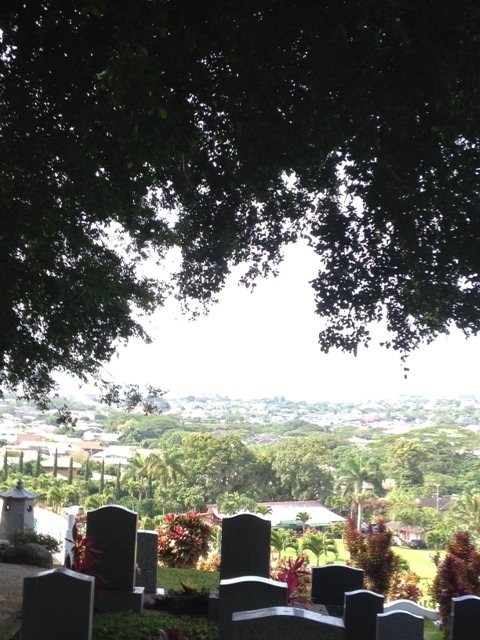 Beneath the canopy of the banyan tree, I gazed to the horizon, past the Honolulu skyline, clear to the aqua sea. Events of my life played in my mind; loved ones here and on the otherside painted through memory like a water-colored mural by Monet. Using the Lord’s Prayer to open my chakras, I felt the expansion of my energy centers and allowed the special frequency of the MCC “chi” to swirl into my auric field. Cleansing, healing, empowering. Though not as well known as Sedona and Stonehenge, the Monoa Chinese Cemetery is another unique energy vortex where earth opens a door to heaven.